As a theatrical piece, opera is surely one of the most difficult to get right. There are just way too many moving parts involved in the process. I mean, how many times have you seen an opera with great cast only to be disappointed by the awful staging, or if they got both right, the conducting was leaden or whatever? However, once in a blue moon, there comes a time where everything falls into place, and more importantly, when your head and heart are also in the right mindset. That’s when when the opera becomes cathartic, life-changing experience. That was exactly what happened to me when I saw Jake Heggie and Gene Scheer’s West Coast premiere of It’s a Wonderful Life Thursday (11/29). Right when I least expected it, the opera hit me like a ton of bricks and left such a deep mental and emotional impression in me. In fact, I was almost reluctant to write about it at first as I didn’t wish to tarnish the exalted memory in my head; but good news has to be shared! The opera, obviously, was based on Frank Capra’s 1946 Christmas classic drama, itself based on Philip Van Doren Stern’s 1939 short story The Greatest Gift. I believe the movie itself need not introduction, as it is considered as one of the greatest movies ever made and it’s extremely popular particularly during Christmas time. In my own state of mind last Thursday, it completely worked on pretty much every single level. I was completely immersed myself in the world of George Bailey and Clara (more on this later); I laughed, danced, cried (even sang along) with the characters. I unabashedly claimed that I loved the opera more than the movie! 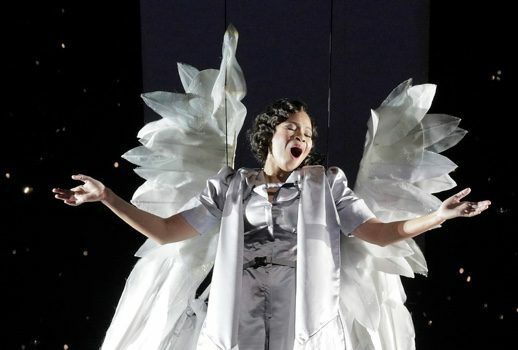 The biggest changes revolved around the decision to cast the guardian angel Clarence into a (significantly) young high-flying coloratura soprano named Clara, frustrated for her lack of wings and determined to do whatever it took to get them. Heggie and Scheer assigned a quartet of angels to guide her in her quest. In the movie, Clarence was mostly shown as voiceover during the exposition of various parts of George Bailey’s life, but here Clara and the Angel Quartet were active participants during those times, though invisible to him and his family. In a way, they became sort of Greek chorus, commenting on the joys and tribulations of George’s life. The expanded role of Clara gave the opera a duality of plotlines; it was also telling the story of her journey to earn her wings. 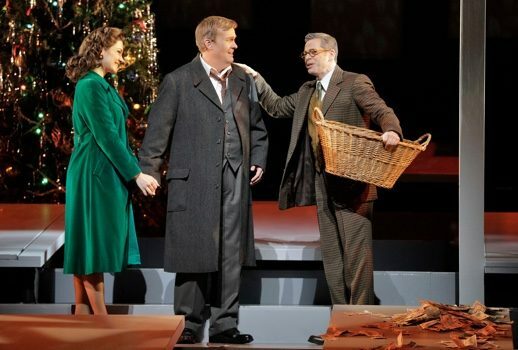 I personally thought this was genius decision on both Heggie and Scheer’s parts; as George Bailey’s life was full of disappointments and failures (leading to that event on the bridge), Clara’s arc line provided a much needed respite throughout the opera, preventing the opera from turning into downright depressing. In one glorious (musically and visually) moment nearly the end, Clara would eventually receive her wings, making the ending a truly joyous double celebration, designed to melt any hard cold hearts in the house! All that was brought to life by Golda Schultz, the South African coloratura soprano who made impressive house and role debuts as Clara. Perky, brimming with joy and determination, her Clara was a sight to behold, particularly as she was on stage pretty much the whole time. Schultz’s bright lyrical voice soared throughout the score, imbued with a deep sense of care and loving for George’s character, particularly since Heggie used Clara’s lines many times to accentuate what George said. It was truly a perfect role for Schultz, and I was so glad to see and hear her debuting with it. Clara also required a great deal of physicality (after all, she spent considerable amount of time hanging mid-air on harness), which she performed with aplomb. Tenor William Burden, a San Francisco Opera veteran performer and no stranger to contemporary operas, turned a brilliant portrayal as George Bailey with his charismatic and earnest take on the role, decidedly different from the iconic Jimmy Stewart in the movie. While Stewart’s George deeply represented a man hardened by the course of time, it was easy to see that Burden’s was a man naturally good and kind driven to depression on that particular Christmas Eve. The way he varied the color of his voice to denote George’s transformation was remarkable; bright and sweet throughout, and rough and explosive as George’s frustration grew deeper. I was glad that Heggie and Scheer decided to reduce George’s outbursts to bare minimum (only keeping those directed to the ones he loved) and remove the altercation at the bar altogether. To complete the leading trio, Canadian soprano Andriana Chuchman was brought in as George Bailey’s wife Mary Patch, also making house and role debuts. Her Mary was sweet and charming, but make no mistake, she was also a fully-fledged woman, more determined than in the movie and perfectly capable of making her decisions. Her round, fuller soprano voice matched nicely with Burden, particularly in the extended love duet that ended Act 1, and provided a nice contrast with Schultz’s flightier tone in their short duet in Act 2. One of the greatest strengths of the production was that Heggie trusted many aspects of it into the hands of his buddies and frequent collaborators, his “crew” so to speak, and their close-knit working relationships manifested in the assured and confident way the opera rolled out. This couldn’t be any truer with regards to Patrick Summer’s conducting. From the first bells of the Prelude, the HGO Music Director, who had led the premieres of most of Heggie’s operas, authoritatively shaped the score into an exciting continuous journey; rich of details and splendors (The bells! The bells!) while not afraid to linger in the most intimate moments, particularly in the La bohème-like duet in Act 1. It required a great skill and a certain drive to guide the long expositions of George’s life, while inherently episodic, from becoming a monotonous bore; and in that sense, Summer excelled brilliantly. Another frequent collaborator was the director Leonard Foglia, and he entrusted his own crew to bring out the story, including set designer Robert Brill, projection designer Elaine J. McCarthy, costume designer David C. Woolard and choreographer Keturah Stickann, all of whom had worked with Foglia in various Heggie projects before. In the movie, the landscape kept changing throughout George’s life, and on stage, Foglia and Brill solved that problem ingeniously by having a rather static set consisted of multiple doors. Upon this set, McCarthy’s projection worked wonder, as the same stage worked as the attic where the angels roamed in the beginning, George’s family living room, even turned blue for the pool scene! The attic scene with its lighted doors had the effect pretty much like Pixar’s Monsters, Inc. Strickann devised a particular dance sequence for “Mekee-Mekee,” a made-up Fiji-inspired ditty that George concocted, and interestingly, this scene (both the music and the dance) turned into a leitmotif throughout the opera, representing George’s dream of adventure. Woolard’s costumes were 40’s-ish and colorful. The biggest pièce de résistance was the world where George Bailey had never been born. Scheer described it best with his quote: “And to us, a world without a George Bailey in it is a world without a soul, a world without … music. To rediscover our world, to live again, George must find his voice and sing himself back into existence.” That was a pure stroke of genius, leaving the audience with a void and uneasy feeling as if we all were part of the dark world without George! It pains me to point out the two mishaps of the performance; both were more technical problems rather than conceptual ones. As the voice of the Universe (or God? ), Patti LuPone(!) lent her voice in pre-recorded form. Unfortunately, hearing her voice through the loudspeaker drowned Schultz’s unamplified singing from the stage, and it made a jarring conversation that killed its effectiveness. Similarly, as George Bailey’s children were all speaking roles (not sure why), and their miked conversations on stage overwhelmed Chuchman’s singing over them. The supporting cast was uniformly excellent. Veteran baritone Rod Glifry sang Mr. Potter in wheelchair so menacingly with his deep gravel voice that he got booed during the curtain call. 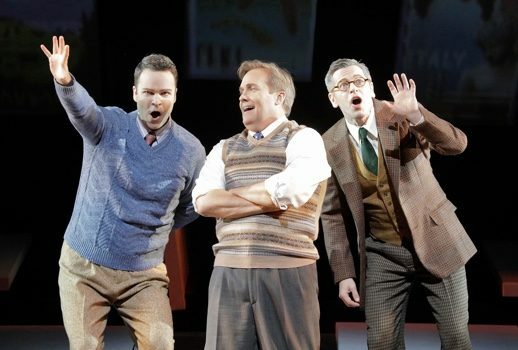 Making an impressive house debuts, baritone Joshua Hopkins imbued Harry Bailey with vitality and vigor, while tenor Keith Jameson was sufficiently awkward yet charming as the good-natured but absent-minded Uncle Billy. The ever-reliable mezzo Catherine Cook added another role as Mother Bailey in her illustrious career with San Francisco Opera. Last but not least, as the guiding Angel Quartet, the Adler Fellows Sarah Cambidge, Ashley Dixon, Amitai Pati and Christian Pursell sang harmoniously and wonderfully. The opera closed with a short choral “No one is a failure who has friends”, sang at first by Clara and George and culminating with the whole company joining in. To me, this was a perfect replacement to Zuzu Bailey’s much quoted “Teacher said, every time a bell rings, an angel gets his wings!” from the movie. By that time, tears had been flowing nonstop in my eyes, and I felt so exalted and exuberant that at the following “Auld Lang Syne” singalong, I stood, grabbed my best friend who sat next to me, and sang my heart out! In a year full of dark days and turbulences, there was no better way to end it with such a high and hopeful note.